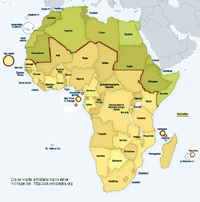 The special collection covers all regions of the whole of Africa with the exception of the mediterranean neighbouring countries, Mauritania, West Sahara, Sudan, Ethiopia, Eritrea, Djibouti and Somalia. All areas are covered except economics, modern law, modern medicine, natural sciences, languages and literature pertaining to the Orient (in particular here Arabic). The first large legacy of the oriental- African collection is due to Job Ludolf (1624-1704), the founder of Ethiopian studies. His work on the language of the Hottentots puts him at the forefront of Africanistic studies. A valuable Ethiopian manuscript collection was presented to the library by the scientist Eduard Rüppel (1794-1884). The African collection was kept up to date with its acquisitions of contemporary reports on research and expeditions and was given more comprehensive coverage with the addition of the Bibliothek der Deutschen Kolonialgesellschaft [Library of the German Colonial Society].This valuable stock (approx. 15.000 monographs and an immense number of colonial journals) was the basis for continually extending the stocks of African literature. From 1964 to 2015 the Deutsche Forschungs Gemeinschaft commissioned the library to be responsible for the Special Collection (Sondersammelgebiet - SSG) area 6.31 "Afrika Südlich der Sahara" [Africa - South of the Sahara]. 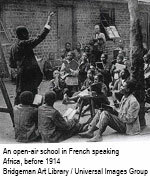 Before the Second World War literature was collected on the whole of Africa; after the Second World War the collection focussed on South of the Sahara. In the meantime the African Collection has expanded to 200.000 units. Since 1964, the Africa Department has been located at the Bockenheimer Warte on the third floor of the reading room section. There is a joint reading room »Lesesaal Spezialsammlungen« as well as an adjoining open stack area with journal stocks. The greater part of the stock is stored in the stacks area and must be ordered online, or by means of a loan slip, one day in advance. Non-local users should, therefore, enquire by post or E-Mail about books or get in touch with the reading room (Tel. 069/ 798-39398). The special collection "Colonial Library" signature (S 17) can only be consulted in the reading room. For access to valuable works, it is necessary to show your identity card (or passport). You can order the borrowable stocks through your own library by means of the interlibrary loan system or through a document delivery service such as Subito.